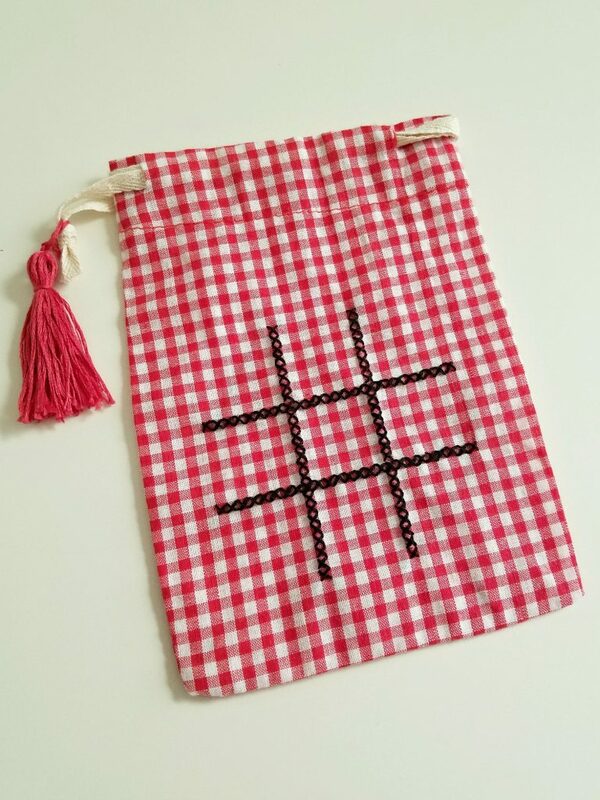 Make this cute Tic Tac Toe (to go) Bag for easy entertaining while running errands or traveling. We live in a world where entertainment is at our fingertips almost all the time, but there’s something to be said for good old fashioned fun. Who doesn’t love a homemade gift either? 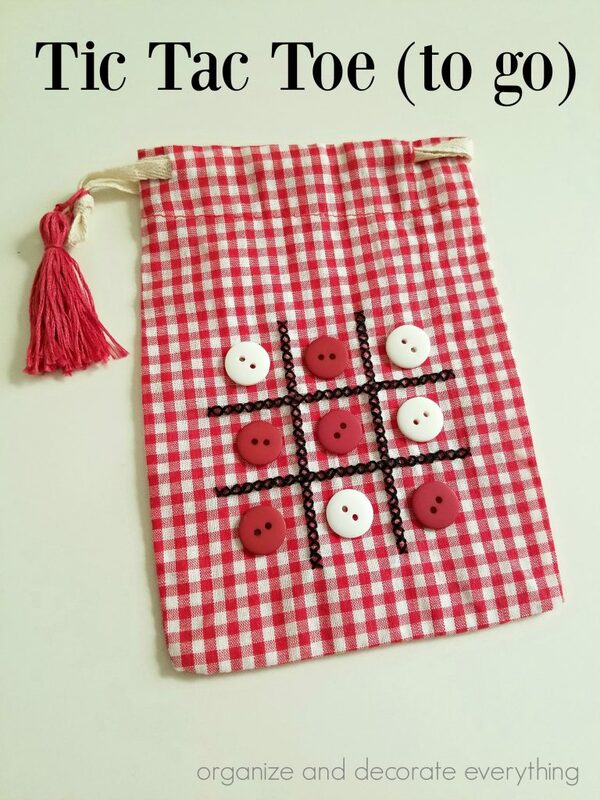 And Tic Tac Toe is one of those games that never goes out of style. Our grandparents played it, our parents played it, we played it, and now our kids are playing it. I thought it would be fun to create a cuter version and while I’m always trying to think of fun gifts this would also be cute filled with little treats and toys. I kind of collect little drawstring bags to add to my craft stash. They’re great packaging for small gifts and you can decorate them in many different ways. I have used vinyl, embroidery, fabric markers, and paint. You can pick the bags up at any craft store, Target, and Walmart. I had this red checked bag and thought it would be cute for Valentines Day. 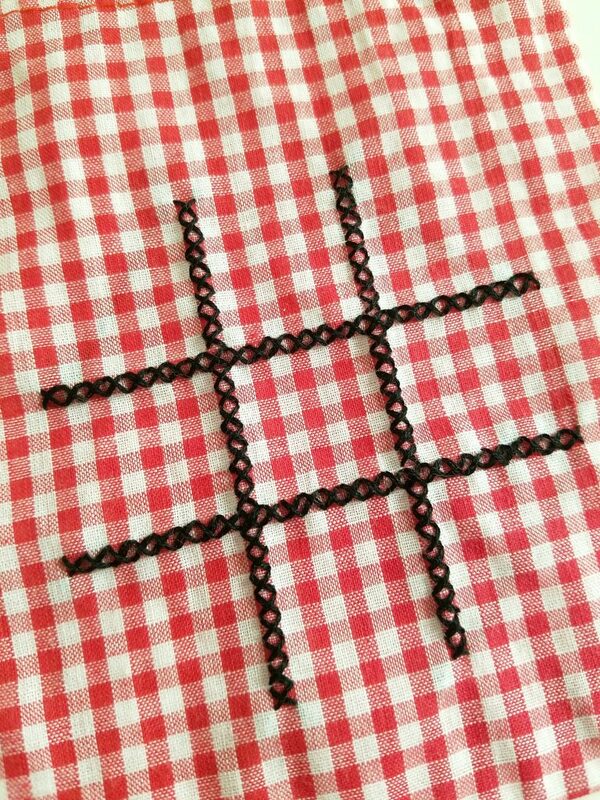 It also made it really easy to make the tic tac toe grid. 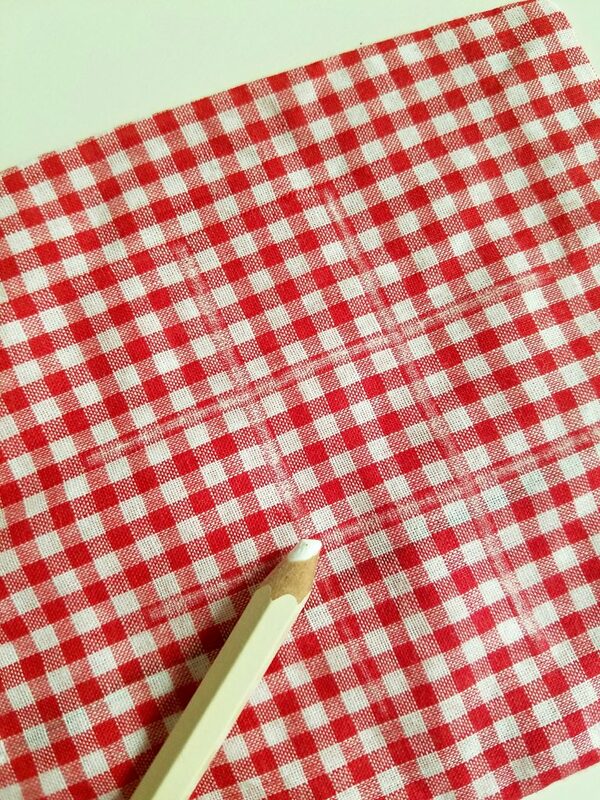 Use a chalk pencil or something that will wipe off to create the grid. I didn’t have to use a ruler because of the checks but if you don’t have a fabric with lines grab a ruler to make the lines straight. I also didn’t have to measure the grid because of the check pattern. To make your life easier you might just want to get a checked bag. I decided I wanted to stitch the grid onto the bag. To make things easier you could make the grid with a paint pen or even attach some ribbon with fabric glue. I just love the look of the stitches. 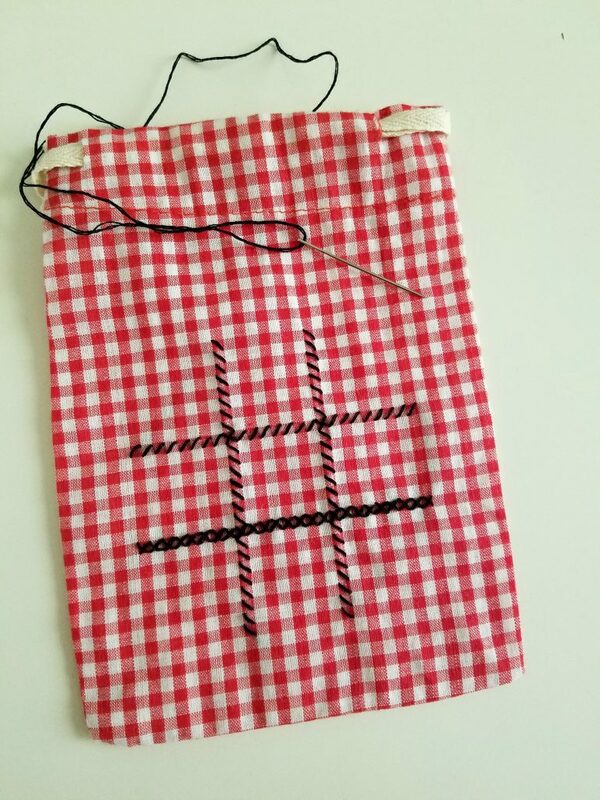 The checks also make it easy to stitch by using each square as the guide. If you’ve never stitched anything before this would be an easy first project. Stitch in one direction and then the other to complete each x. Usually I would use an embroidery hoop to keep the stitches consistent, but since this bag was already made that wasn’t an option. I still think it turned out pretty good and I love the texture the stitches add. I also made a tassel for the end of the drawstring. 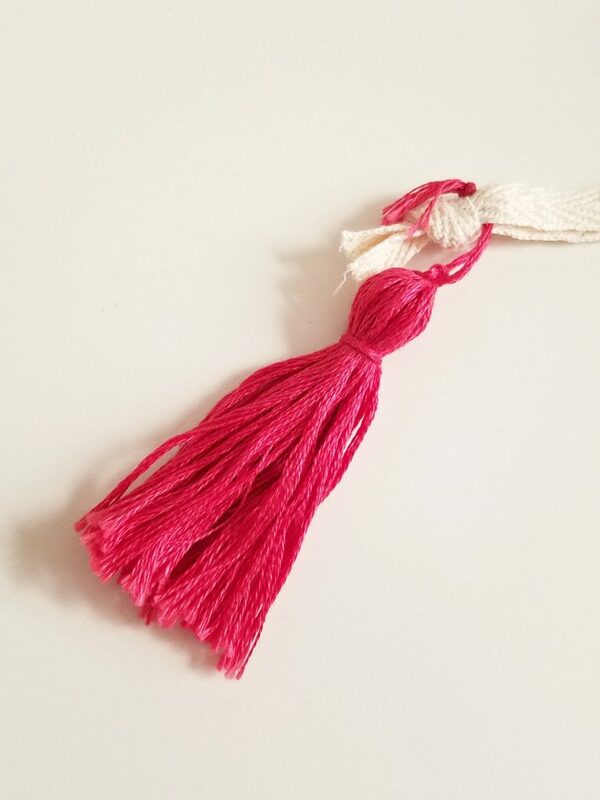 I will share how I made the tassel in a post next week and link it back here. I also cut the drawstring to make it a little shorter before I added the tassel. Store the buttons in the bag and pull the drawstring tight to keep it closed. 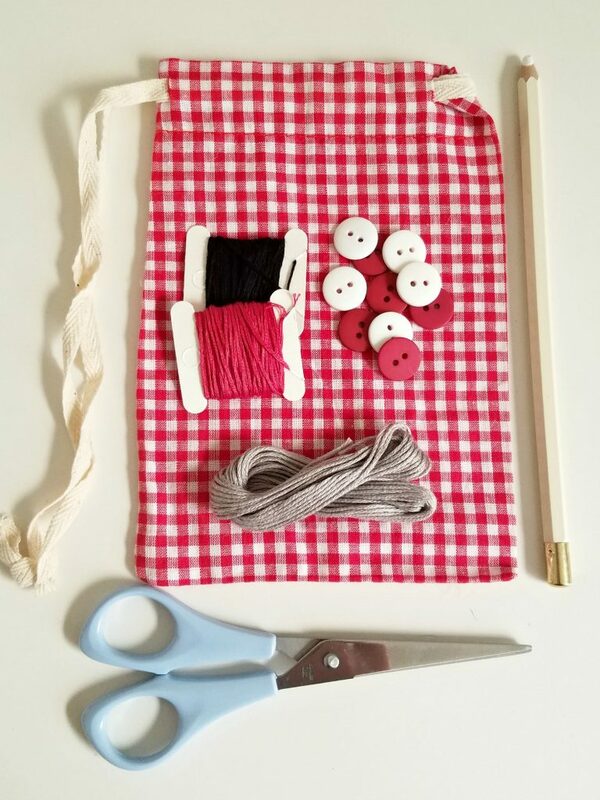 You can also fill the bag with treats and other little toys to keep the kids entertained while you’re traveling or running errands. 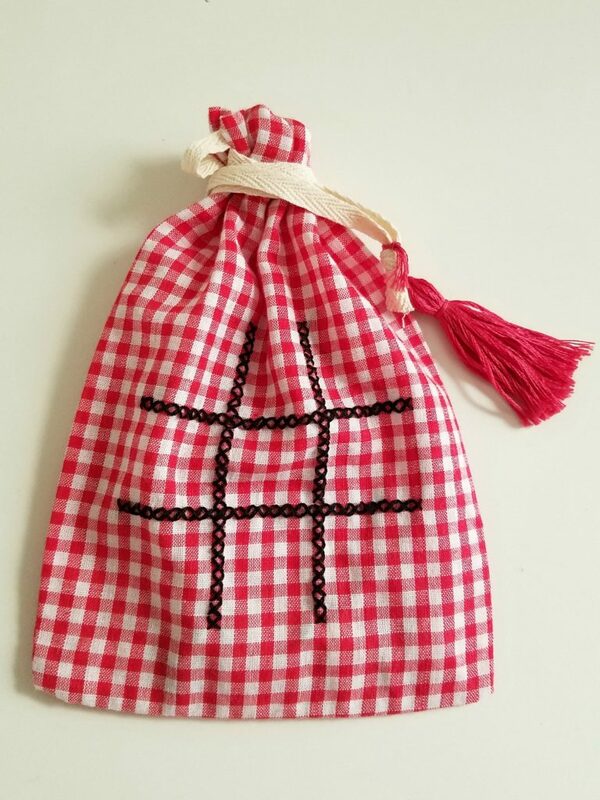 I hope you enjoy making this fun little game in a bag. It would make a cute Valentines Day gift especially with heart buttons.